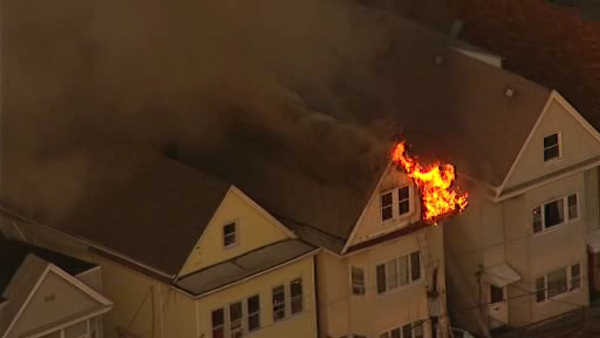 BAYONNE, New Jersey (WABC) -- Firefighters battled a third-alarm fire that burned through the roof of a Bayonne house Monday morning. The fire broke out at a two and a half story row house on West 26th Street just after 6 a.m. The fire was contained mainly to the top floor. Firefighters were forced out of the burning building when flames shot through the roof. No injuries were reported, but the fire has caused damage to the house next door. West 26th Street was shut down between Avenue A and Kennedy Boulevard as firefighters continued to battle the blaze. NewsCopter 7 was over the scene in Bayonne, where firefighters battled a 2-alarm fire. A family of five was left homeless by the flames.